Nick LaRocca and the first jazz record, at 100. 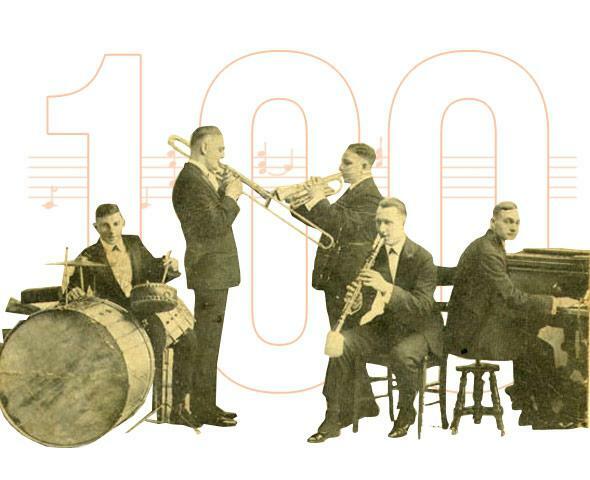 This month, the first jazz record celebrates its 100th anniversary. The bandleader claimed white people alone invented jazz. The Original Dixieland Jazz Band. Photo illustration by Natalie Matthews-Ramo. Photo of Original Dixieland Jazz Band scanned by Infrogmation from original 1918 promotional postcard. One hundred years ago this week, on Feb. 26, 1917, jazz was committed to record for the first time. The Original Dixieland Jazz Band’s renditions for Victor records of “Dixieland Jass Band One-Step” and “Livery Stable Blues,” released nine days after they were recorded, were the first jazz performances most people ever heard. The record sold 1 million copies, inaugurating a musical and cultural craze. He certainly couldn’t miss them once he began playing (around 1910) with the Reliance Brass Band, led by “Papa Jack” Laine, a white ragtime drummer who hired black musicians despite Jim Crow laws. (Laine, unlike Oliver, appears in The Story of the Original Dixieland Jazz Band, Harry O. Brunn’s 1960 history based mostly on interviews with LaRocca—but the fact that the band was integrated is conspicuously absent.) Nonetheless, when they were offered work in Chicago in 1916, the quintet LaRocca and drummer Johnny Stein assembled out of Laine’s orbit was all white. Thus it was a white band that found success in Chicago as Stein’s Dixie Jass Band (using a local slang term for New Orleans’ ragtime variant) and that Broadway star Al Jolson recommended for a gig at Reisenweber’s Café in midtown Manhattan. And it was a white band (now sans Stein) that created a sensation there in January 1917—Reisenweber’s soon bore an illuminated sign calling them “Creators of Jazz”—and was invited just six weeks after arriving to make a record for the Victor Talking Machine Co. The B-side, “Livery Stable Blues,” became the hit, with its novelty “animal sounds” hook. But its rhythm is stiff: stolid 4/4 time, brass and piano playing even eighths with little variation. If there’s improvisation present, it’s hidden behind verbatim repetitions. “Dixieland Jass Band One-Step,” which became a standard, is looser and more playful—but still rote and unimprovised. These aren’t the sounds of rebellious innovators but of too-scrupulous imitators. Come the ’20s, black New Orleans musicians (and white ones) would execute the same ideas with much more freedom and spontaneity. Casting oneself as a sole creator isn’t rare; New Orleans pianist Jelly Roll Morton would do the same thing in his later years (although Morton, a true visionary, was more exaggerator than usurper). White musicians building their careers on black music was also and still is routine. What makes LaRocca’s case remarkable is his toxic mix of narcissism and white supremacy. This began long before LaRocca’s 1936 claim that jazz was “strictly white man’s music.” According to Brunn, the ODJB killed a record deal with Okeh Records in 1923 “when LaRocca discovered that they were being advertised by the company as ‘race’ records”—that is, records (usually by black artists) that were marketed primarily toward black audiences. For LaRocca, this was apparently a bridge too far. His beliefs became more virulent, and bizarre, with age. Among LaRocca’s papers at Tulane University’s Hogan Jazz Archive are a mass of typewritten (and typo-laden) letters he wrote, especially in the last years before his 1961 death, casting himself and his band as geniuses deprived of proper credit. Critics and historians, he wrote with disgust to discographer Brian Rust, were “nothing but Integraters to mix white and Colored,” likely sponsored by “Communist from Russia.” It’s a popular recipe, even now: racial angst, political paranoia, contempt for the press. To French broadcaster Jean-Christophe Averty, LaRocca presented revisionist history that was silly even in 1956: The ODJB had saved white musicians from being marginalized by black ones. “When the O.D.J.D arrived in New York City Broadway was Black as all the Bands were Colored,” he told Averty. “As soon as the white Northern men had studied our style … Whitemen regained their jobs and Broadway was The White Way again.” That’s right: Nick LaRocca was the man who Made Broadway Great Again. By that time, he was often referring to himself as “the creator of jazz.” The quintet’s importance dimmed; LaRocca even sued original clarinetist “Yellow” Nuñez, who had copyrighted the breakthrough “Livery Stable Blues,” for stealing his tune. (The judge resolved the dispute by awarding the copyright to neither artist and passing the song into the public domain.) That was only the beginning of LaRocca’s egotistical hyperbole. In one letter, LaRocca referred to himself as “the most lied about person in history since Jesus Christ”; in two others, he called himself “the Christopher Columbus of music,” a description that was more apt than he intended. All this certainly gives credence to the notion that Donald Trump and his ilk have set America back 100 years (assuming we’d actually advanced in that time). Yet it also offers a ray of hope. A century on, history acknowledges LaRocca—but also sees him as a bigot, liar, and usurper who consistently undermined his own not-insubstantial achievement. Despite his persistence, America came to see his claims for what they were: alternative facts.